Wrap each cocktail link with 1 dough strip around middle of link. Place on ungreased cookie sheet, seam side down, about 2 inches apart. Bake 10 to 12 minutes or until golden brown. In large bowl, toss grated cheese with the flour. In 2-quart saucepan over medium heat, swirl in the olive oil. When shimmering, add the garlic; cook 30 seconds until very fragrant. Add stout, apple juice concentrate, ground mustard and Worcestershire sauce. Heat to a simmer (let simmer 3 minutes if you want alcohol to evaporate) and gradually, in small batches, add cheese, constantly stirring until fondue is smooth, thick and cheese completely melted. If too thick, stir in an additional oz of stout until desired consistency. 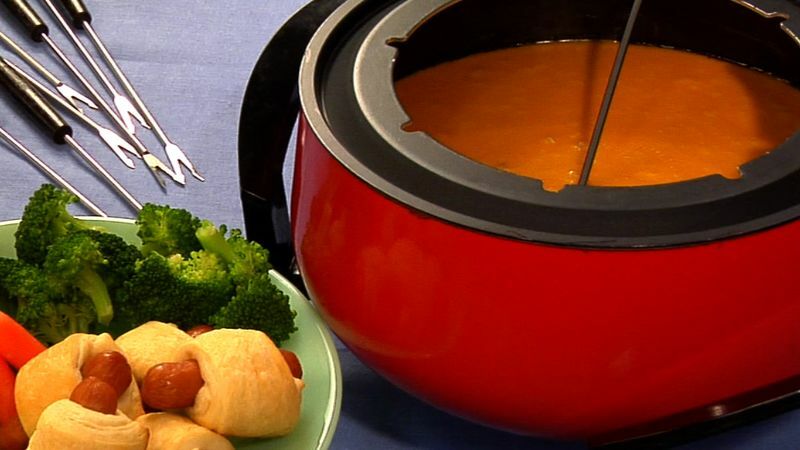 Serve fondue immediately with pigs in the blanket. The most important step in making fondue is to toss the flour with the grated cheese. This helps the flour incorporate and thicken smoothly. If you just dump the flour in by itself, you'll end up with a clumpy mess. Leftover fondue can be stored in the refrigerator....we bring it out on Christmas Day and serve as a chilled, flavorful cracker spread.